This is one large case of beer. It holds 77 cans of Natural Light. (WTOL/RNN) - There’s nothing worse than watching football at your house on a Sunday and then realizing you’re out of beer. Or running out of beer when you’re the host of an epic party. Okay, there's a lot of things that are worse, but you get the idea. Anheuser-Busch is making sure that this won't happen to you, at least if you live in College Park, Maryland. 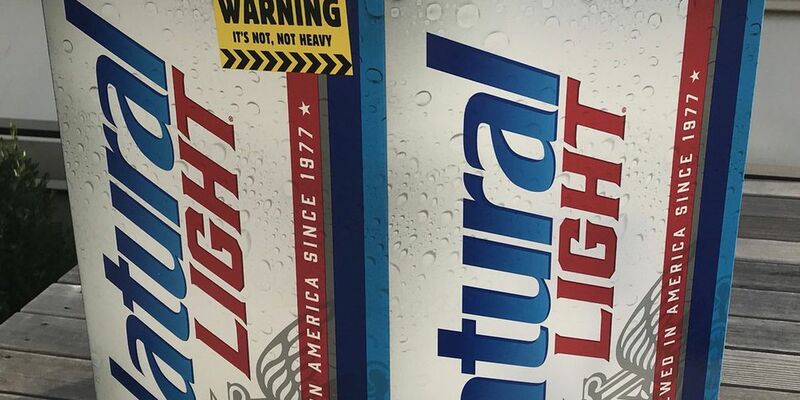 The company is releasing a limited time only 77-pack of Natural Light. It is unclear why the pack, which holds 7,315 calories of beer in total, is only being introduced in College Park, but it is clear why 77 beers were the magic number; Natural Light was created in 1977. According to Food and Wine, the pack is said to weigh 65 pounds, and that the giant 77-packs will be available in stores any day. University of Maryland students, rejoice. Copyright 2018 WTOL via Raycom News Network. All rights reserved.